Looking for a Replacement Shower? At Edmonton Bath Products, Ltd., we established a commitment when we opened our doors in 1979 to the finest locally manufactured parts for our customers — and the utmost in quality installation. 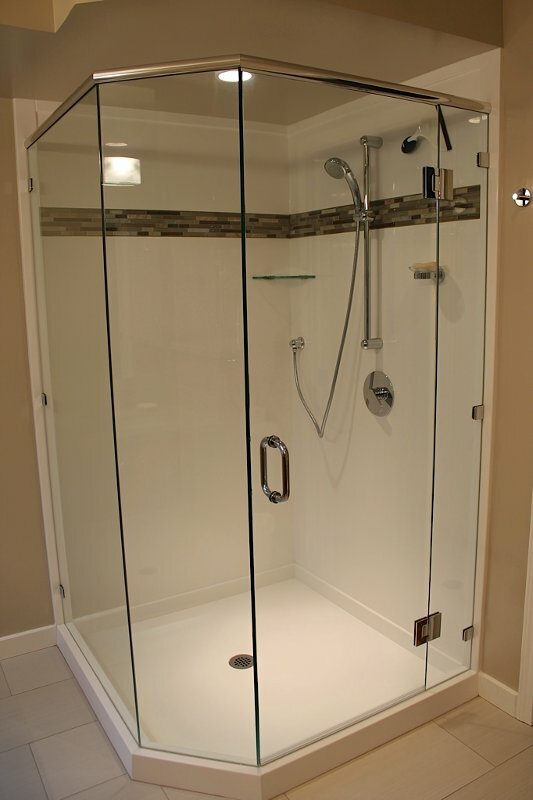 If you are considering replacing your shower — or are simply concerned about your shower stall base and are considering a new one — give one of our shower installation specialists a call today. At Edmonton Bath Products, Ltd., we work collaboratively with our clients — which means that we don’t try to force choices on you. Instead, we come out to your home and look at the space you have to work with. We’ll sit down with you and talk about the available options, and after you have selected the one that you want, we provide you with a written estimate of cost and time. After we come to an agreement, we will schedule a time for your installation to take place. 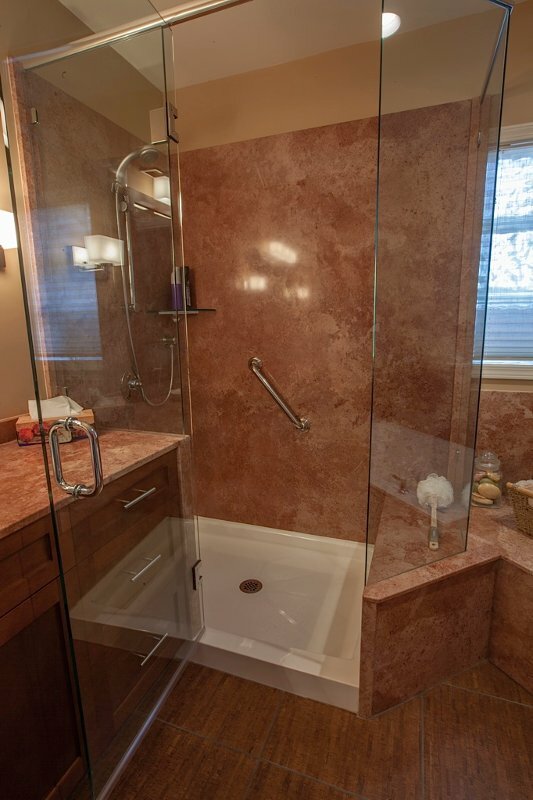 If you’re taking a shower in a bathtub that has one of those flexible rods running along one side and dangling a curtain down, it’s time for a major upgrade in your bathroom. 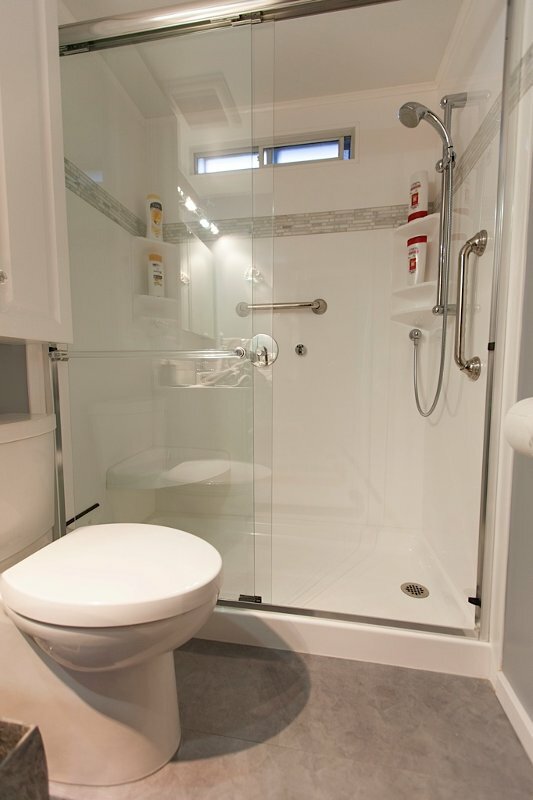 Most people who have that type of shower scene in their master bathroom have room for a separate bathtub and shower without sacrificing space in any other part of their bathroom — and Edmonton Bath Products has been upgrading showers since we opened in 1979. 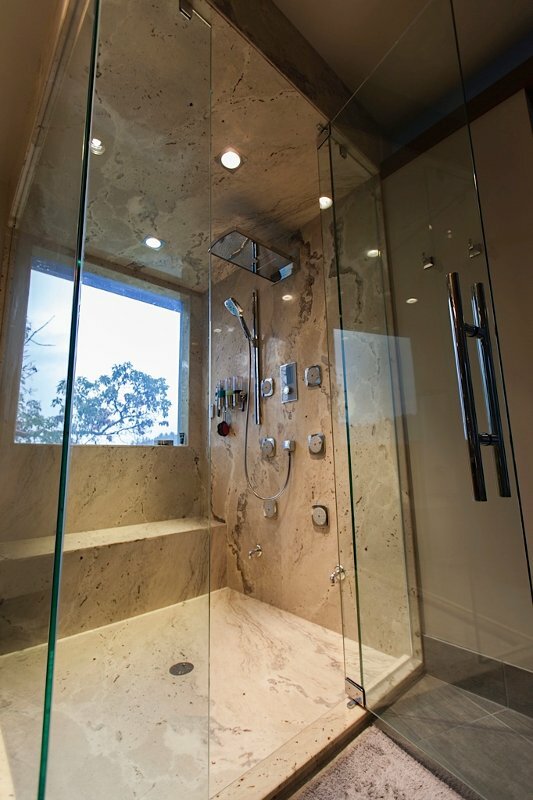 Make your dreams for your bathroom renovation come true by choosing the shower that will be an integral part to your luxurious retreat from the outside world. 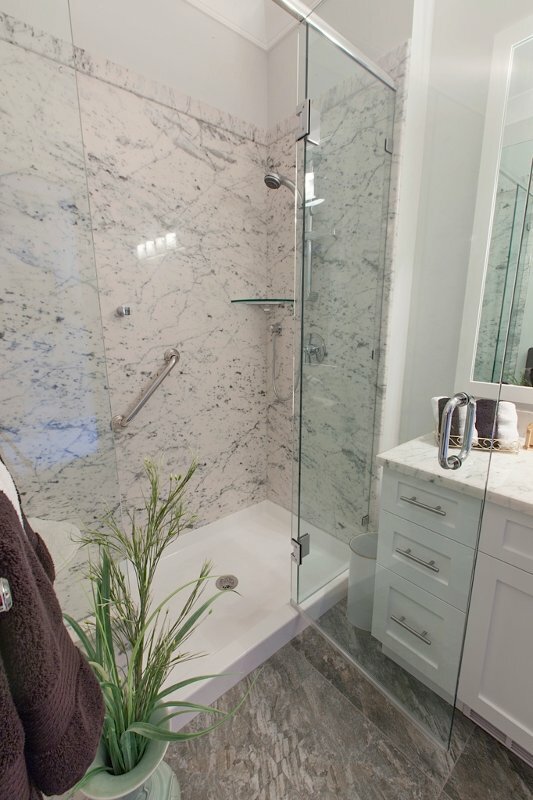 A bathroom isn’t just something to use — it is a space to help you recharge and rejuvenate for the day ahead. 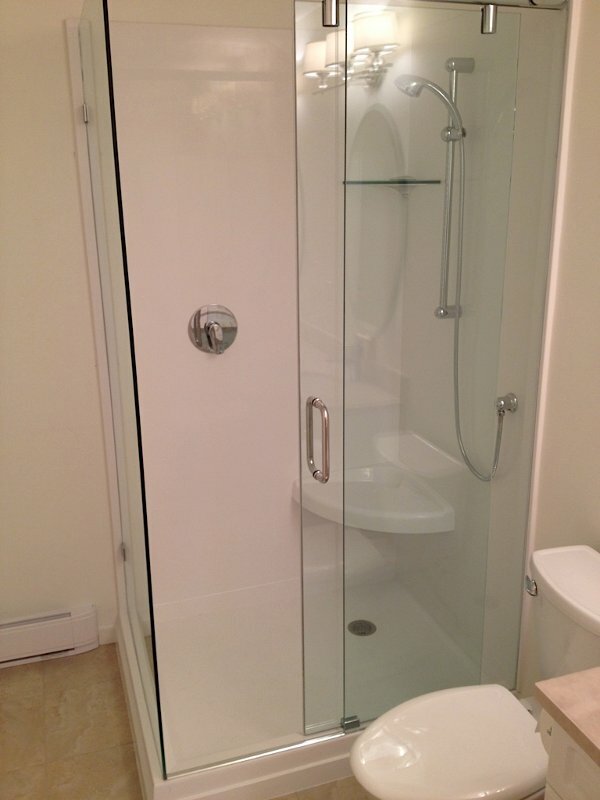 Let Edmonton Bath Products help you find and install the perfect shower for you and your family. What sort of look are you going for in your bathroom? 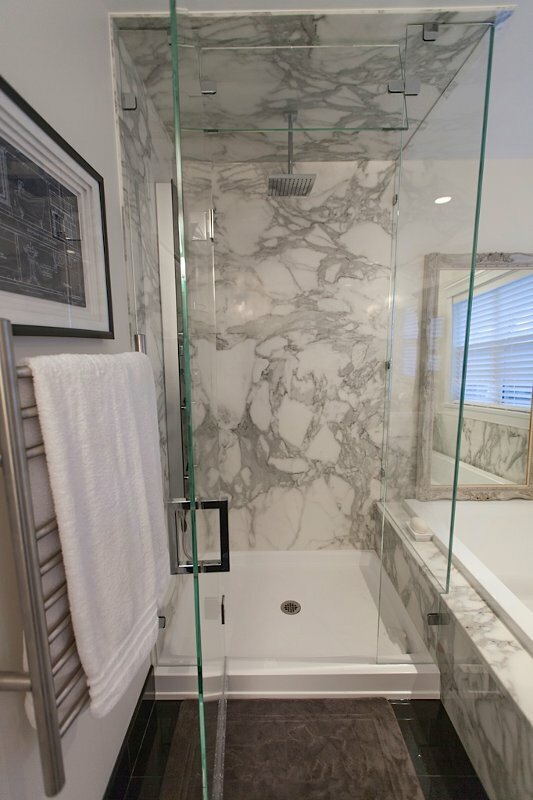 One popular choice among our Edmonton shower renovation clients involves a marbled tan or grey marble surface on the wall sides, with glass from the floor to the top of the stall on the other sides. They have a window cut in the outside wall that comes down to just below the shoulders, so that they can see out and natural light can be a part of getting ready. The window is high enough on the wall to guarantee modesty, and there’s really no reason to keep light out of your bathroom. If your master bath is on the first floor but you like the idea of natural light coming in, frosted glass is a great alternative that lets the light in without letting your neighbors know way too much about you. One of the best things about our cultured marble and cultured granite surfaces is that, thanks to the mottling of colors, no two products are going to look exactly the same. 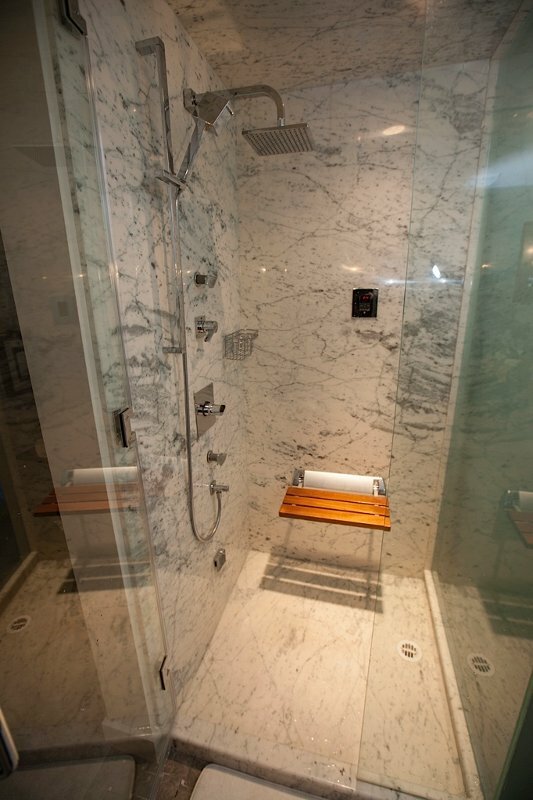 Whether you choose a simple one-head option or a wall with a number of different jets to make your shower a real sensory experience, you’ll also enjoy the distinctive look of the marble or granite on the walls during your shower. 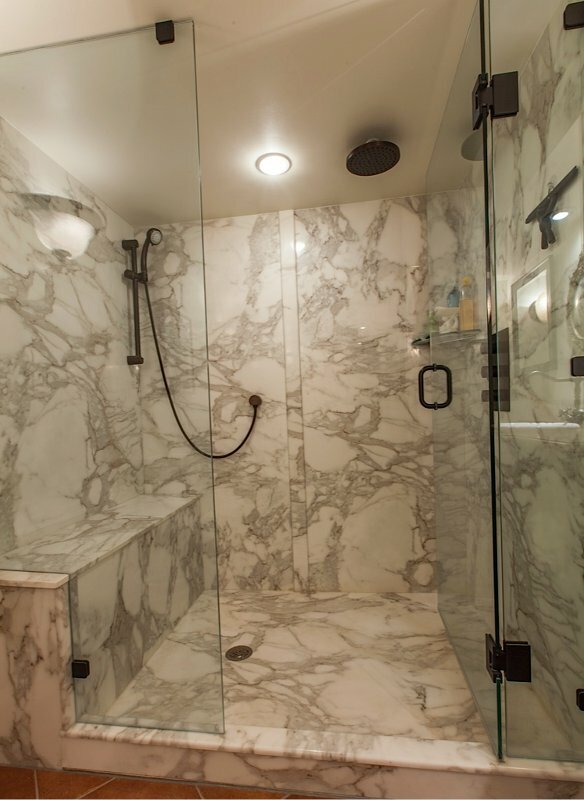 Some of our clients want more of a traditional look in the shower, opting to remain with white or cream tile rather than going for the marble look. We offer the finest in the manufacture of shower walls and bases in a wide variety of colors and designs to suit the neds of our clients. 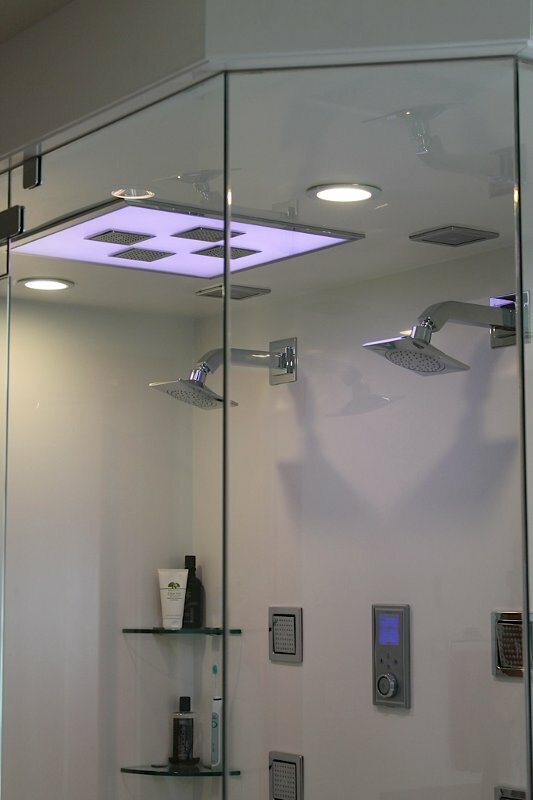 When it comes to choosing such fixtures as the lighting, shower heads and controls, the sky is really the limit when it comes to making a custom shower for your bathroom. 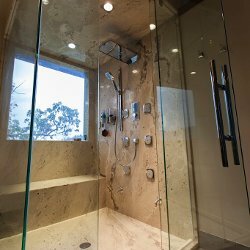 Some people with expansive room opt for a two-head installation so that a couple can shower together — but won’t have to spend time deciding which one will shiver while the other one gets the infusion of hot water. People who are taller than average — or just like the sensation of water from directly overhead — ask for a waterfall shower head that comes from directly over them, rather than angling out from the wall. Ask your consultant for references from satisfied customers, and contact them to get perspective about how we go about our business. 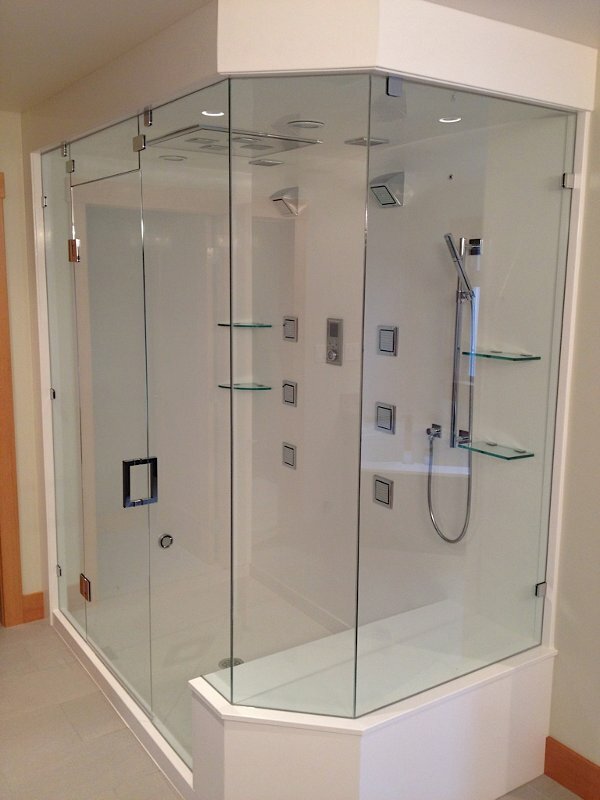 We guarantee customer satisfaction at each stage in the process — and we will work with you until you are completely satisfied with your new shower base. Give us a call today!